Scary Stories to Tell in the Dark: Gammell vs. Helquist – AiPT! 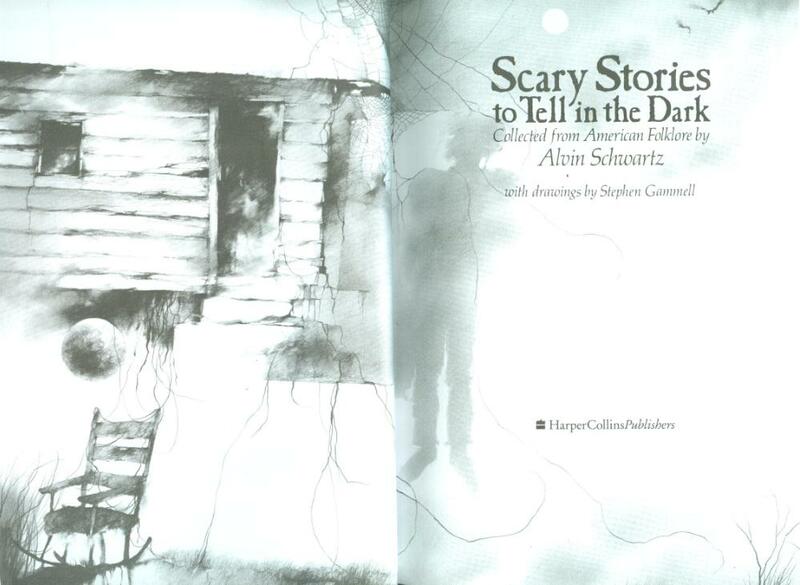 First published in 1981, Alvin Schwartz’s Scary Stories to Tell in the Dark series has since become a necessary staple of every elementary schooler’s intellectual development. Namely, it’s how they learn that books can make you s--t your pants. Not to detract from the late author Alvin Schwartz’s contributions to the three-book series; he had a knack for culling the most unsettling examples of folk lore and urban legendry from the collective unconscious and distilling them into a simplified narrative that appealed to the reading level of children whilst not losing an ounce of their spine-tingling effectiveness and grim brutality… but it isn’t the text that folks remember giving them nightmares until they turned thirty. It was the chilling, phantasmic artwork by Stephen Gammell. And to celebrate the 30th Anniversary of the Scary Stories book series, publisher Harper Collins decided to eliminate all traces of Gammell’s presence, replacing the original illustrations with new ones by celebrated artist Brett Helquist. Yeah, Happy Anniversary, indeed. Scary Stories to Tell in the Dark, More Scary Stories to Tell in the Dark and Scary Stories 3: More Tales to Chill Your Bones have been three of the most challenged pieces of children’s literature for their thirty years in publication due to the ghastly content of the tales collected and, more-so than that, the gruesome illustrations that have caused many a child to begin crying on the spot. Gammell’s skill at reaching into the darkest depths of his imagination and returning with vivid nightmares which he then captures in all their macabre detail through his paintings is, simply put, unmatched. Harper Collins has shown impressive resolve over the last three decades in standing their ground amidst all the bannings and controversy over the immensely popular book series; so why they finally waited until the 30th Anniversary to relent and remove the most objectionable quality of the books is beyond me. In a way, it’s a matter of principle; they stood firm for so long, why finally fold after thirty years? But it’s also that, after so many, many years and being fondly remembered by so many generations of terrified children, Scary Stories has come to be defined by the art of Stephen Gammell; remove his contributions while leaving the text untouched and, well, it just isn’t Scary Stories anymore. That’s not to say Brett Helquist isn’t a skilled artist of the creepy and the obscene. Helquist is perhaps best known for illustrating the books and the merchandise for the “Series of Unfortunate Events” children’s novels. He is extremely talented and respected… but he isn’t Stephen Gammell. 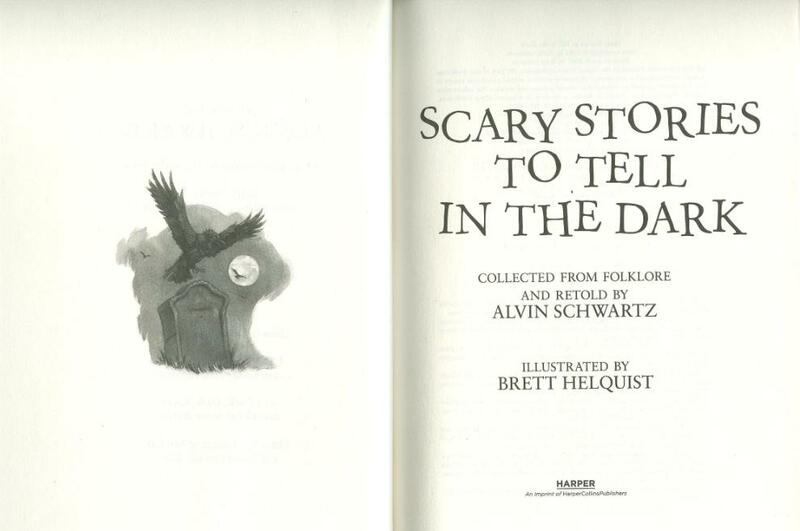 His contributions to Scary Stories are admirable, and while they’d be superb when attached to any other collection of ghost stories for children, they have thirty years of an established visual presence to stack up against and there’s just no overcoming that. So here are a few comparisons between Gammell’s original illustrations and Helquist’s substitutions. Right off the bat, when you open up Helquist’s edition, you can tell that you’re in for a far less elaborate experience. This is just the *title page*; you haven’t even gotten to the content of the collection yet… And already Gammell’s version is firing on all cylinders with a dark and surreal backdrop. An old rural house floating in some weird dimension, an unoccupied rocking chair, the silhouette of a man who has hung himself… You haven’t even gotten through the title of the book and already you’re feeling wary. It’s like one of those sign posts outside a dark forest reading “Danger: Do Not Enter”. Frightening, yet alluring you to proceed with apprehension. Meanwhile, Helquist drew a bird and a tombstone. Very creative. There’s also the dedication page, “To Dinah”; Gammell draws a rusty, cobwebbed wheelchair while Helquist draws nothing. Before even getting to the stories themselves, Helquist’s editions are already a blander, less unsettling experience. This comparison illustrates one of the major differences between Gammell’s approach and Helquist’s. Gammell is more about conveying the notion of dread rather than capturing the minute details of the scene and the setting. Here in “The Walk”, there’s a fog-shrouded forest and two dark figures becoming separated in the mist; or perhaps they’re approaching you? You don’t know WHAT they are and, in a way, you can just look at this drawing without reading the accompanying story and come up with your own tale. It’s food for the eeriest part of your imagination. Helquist, meanwhile, goes for interpreting the text explicitly. He captures the scenes as they’re described and what liberties he takes tend to revolve around setting the illustrations in a distinct period. This robs the story of its timeless quality; which Schwartz’s vague prose made certain to create. It’s not so scary when it’s happening to a pair of guys from the Victorian era; the reader is safely separated from the danger by a century or more and thus they become less engaged. But black shadows in the woods after dark? That could happen to anyone at any time and that’s what makes it so much more effective. There she is, boys: The face that shat a thousand pants. Gammell’s illustration for “The Haunted House” is without a doubt the most iconic image in the entire Scary Stories series; even becoming the cover of the Treasury edition that collects all three books in a single hardcover volume. No mystery as to why it’s so famous among people who grew up with the books: it is extremely effective. As with “The Walk”, Gammell’s version succeeds in that it places the reader in the story. The ghost is looking at YOU. YOU are trapped in that creaky old house, staring down the empty, rotted eye sockets of some girl who was strangled by her lover. Many of Gammell’s illustrations take this approach, putting the “shot” of the piece in the POV of the reader. Rarely are multiple parties visible at the same time. Gammell places you in the story and that’s what makes nine year-olds want to drop the book and swear to never open it again. Gammell removes the neutrality of third party observations and puts YOU in danger. Helquist, meanwhile, chooses to render the scene as depicted in the book. The ghost doesn’t notice you because you aren’t there. It’s just a picture in a book and the only one in danger is the priest. For what it’s attempting to do (illustrate the scene as described), it’s actually a rather nice piece and I suppose that’s something that’s getting away from me here as I work myself up; all of Helquist’s illustrations are excellent pieces of art. They’re very dynamic, and though they don’t match how I always imagined the story in my head over the past 20 or so years (and how could they? ), they’re suitable depictions. But they just aren’t scary. The neutrality of the audience makes them less engaging. Another good example is the illustrations for “The Thing”. Gammell once again opts for a frontal shot of the monster, staring directly at the reader, while Helquist takes the angle to behind the monster’s back as he menaces two children. The reader is in a perfectly “safe” position and the entire experience just loses an element of excitement. I’m a bit on the fence about this one. Gammell’s illustration is incredible; this utterly bizarre, incomprehensible universe of nightmares and you just can’t tell what the HELL is going on… but it has absolutely *nothing* to do with the story it is attached to. It’s just awesome. Helquist’s earns points for actually relating to the story (about a girl being woken in the middle of the night by her roommate’s whistling, only to find her roommate beheaded in the morning along with the realization that the whistling belonged to the killer)… but for being scary or unnerving? Not so much. Now here, I feel, it is entirely fair to compare the two versions against one another as it is a case where both Gammell and Helquist take the same approach to the material: “Scary-looking scarecrow staring at the reader”. However, I don’t think there’s any doubt which incarnation of Harold is the more frightening. Gammell’s version could almost be a madman disguised as a scarecrow, but you’ll be damned if you’re going to get close enough to check. Meanwhile, Helquist’s is definitely a dude made out of straw, but in a way, he almost looks “cute” which takes away from the horror. The fact that he looks so wispy and, yes, made of straw also makes him less threatening. Meanwhile, the hulking monstrosity of Gammell’s Harold leaves no doubt that he could kill you and tan your skin on the roof of the farmhouse. These are just six examples among scores and scores of them. Everything about the production of the 30th Anniversary edition of Scary Stories to Tell in the Dark is lacking in comparison to the originals. The illustrations are smaller and only accompany the stories-themselves; small graphics that could be confused for generic clip art accompany glossaries, dedication and title pages. Helquist’s drawings are expertly and professionally rendered for what they are, but they don’t approach the lavishness of Gammell’s sinister paintings. While this would be a fantastic production of just about any other book of ghost stories, when compared to its predecessor, it’s simply a cheap and uninspired product. The necessity of this edition completely eludes me. Why celebrate the 30th Anniversary of the book by changing its most notable feature? The Gammell editions remain in print, so it isn’t “replacing” them, either; the Helquist edition is simply here to coexist with the originals for reasons I cannot fathom. I suppose it may have been done as a compromise to all the school boards and PTAs that have been picketing Harper Collins’ offices for three decades. Gammell’s original editions aren’t going away, but now a “less intense” version of the book has been published to appease outraged Helen Lovejoys the country over. Not a notion I can get behind, I must confess. No child should ever have to grow up without Stephen Gammell’s artwork keeping them up at night. I don’t want to imagine a world like that. It’s just too… frightening. As it turns out, the original Stephen Gammell editions HAVE been taken out of print by the publisher! At least at the time of this update, anyway. Prices on new and used copies are already inflating on sites like Amazon.com in response to the altered art, too (a new copy of the Treasury edition from a 3rd party seller is going for $50 bucks at the cheapest).